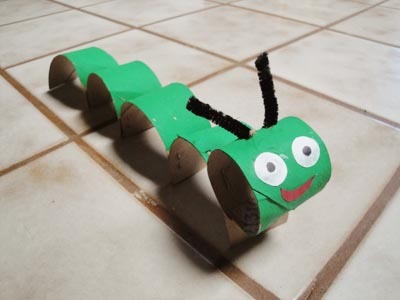 Here's a simple, cute, recycled craft I made with my three year old using one old paper towel tube. You could also use a couple of toilet paper tubes. Cut the sections out and secure them together at the bottom using staples. I let my daughter paint the whole thing green (she loves getting to do the painting part of crafts) and then we glued on a face and stuck chenille stem antennae through his head once he was all dry. It's surprisingly sturdy and my daughter loves carrying it around the house and playing with it. How does your family like to learn?